One cookie, two cookies, three cookies, four. Five cookies, six cookies, seven cookies, more. Gingerbread, gingerbread, touch the ground. Gingerbread, gingerbread, climb the stairs. Gingerbread, gingerbread, say your prayers. Gingerbread, gingerbread, turn out the light. Four gingerbread men sat on a tray. So the gingerbread men all ran away! 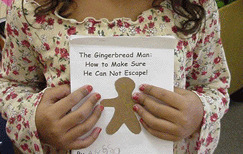 In this book, the gingerbread man is not able to escape because the children bite off arms, legs, and head (actually tear off parts). 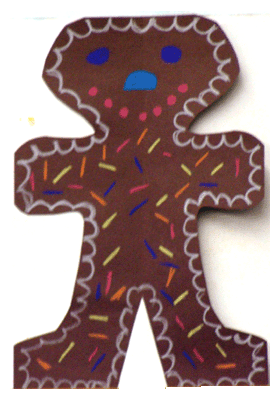 You can use an Ellison gingerbread man, purchase a tablet, or cut your own. 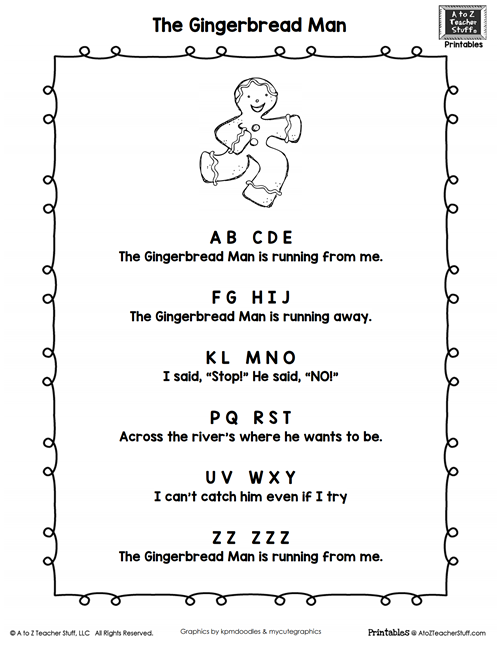 Complete one page for each child by having them fill in their name and illustrate the gingerbread man. “Run, run, as fast as you can! 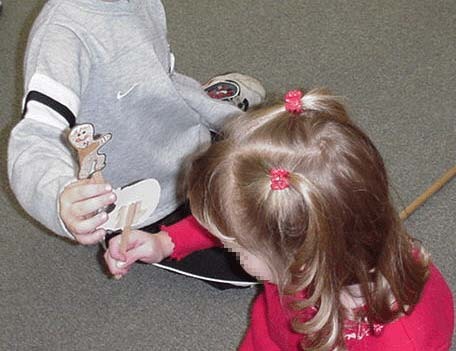 Use story character puppets to act out the story. We read several different versions of the book, The Gingerbread Man and compared the story characters in each. Our favorite version was The Stinky Cheese Man. lots of cinnamon, allspice, ginger, nutmeg, whatever! scent and color you want. Mix water and oil together first and THEN add them to the dry ingredients and stir. In a pot, cook the mixture for two to three minutes, stirring frequently. The dough will start to pull away from the sides of the pan and clump together. Take the dough out of the pan and knead the dough until it becomes soft and smooth. Allow to cool and store in an air-tight container. Place gingerbread playdough in the sensory table with gingerbread cookie cutters of various sizes. Don’t forget the cookie sheets and rolling pins! 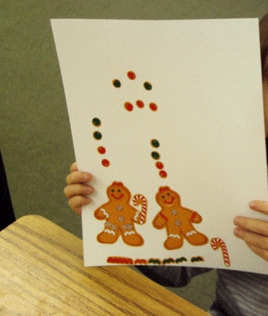 These are stickers that can be used to decorate the Gingerbread boy and girl. 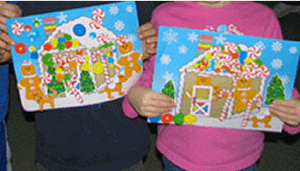 The stickers are used to create a Gingerbread cottage. Both sets of gingerbread stickers are available from Oriental Trading. The gingerbread cottage is two houses glued together around all the edges except one section of the roof–this makes a storage envelope. 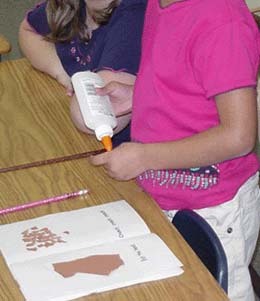 Vocabulary words were written on gingerbread boys and girls. These words can be practiced and stored in their own house. This is a visual discrimination game. 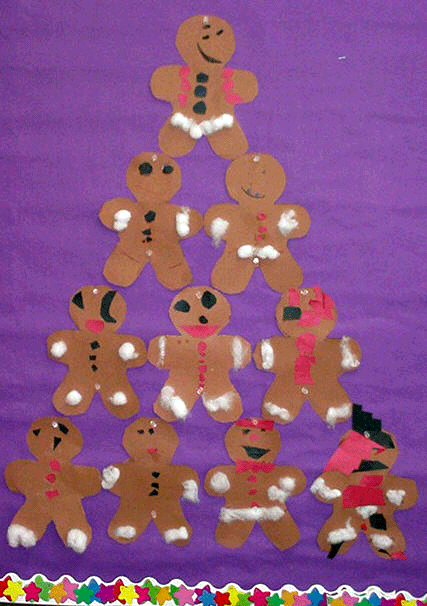 Gingerbread men in various positions are on placed on the gameboard and on cards. 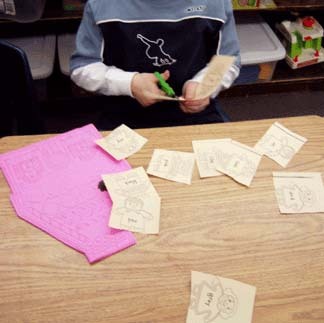 The student draws a card and proceeds to the first block with the matching gingerbread man. First one to get to the gingerbread house at the end of the game board is the winner. Students need a blank sheet of paper or use the dotted template included in the download. 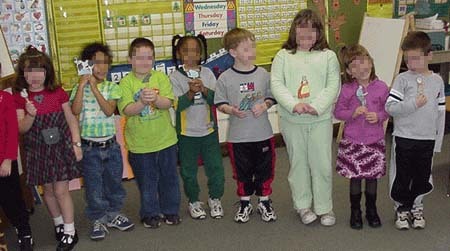 They work in small groups and take turns rolling a die to make a gingerbread man, including his head, body, face 2 arms, 2 legs and at least 3 buttons. The first one to finish drawing his gingerbread man is the winner! 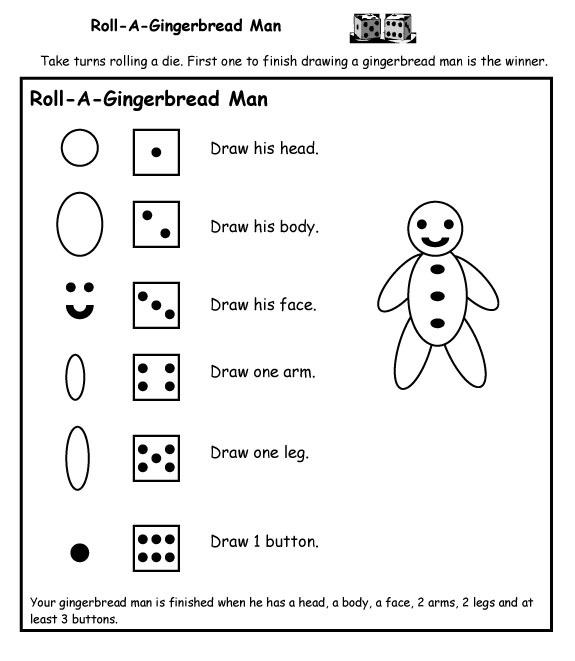 Click here to print out the Roll a Gingerbread Man game. 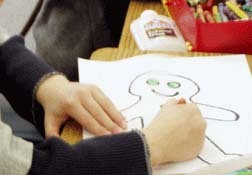 The pre-drawn dotted gingerbread man would be helpful for the students if they roll a 3, 4, 5, or 6 before they’ve drawn the head or body. It gives them a point of reference to draw their face, arms, legs and buttons. 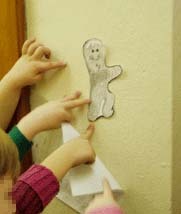 Then we drew conclusions and posted our Gingerbread Glyph in the hall. These stackable men were purchased from Oriental Trading for counting activities. 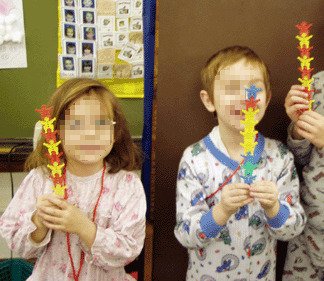 I taped gingerbread cutouts together and the children found something in the room that was the same length. This boy found that the chart holder is 6 gingerbread men tall. He discovered that the big book was 4 gingerbread men long. She noticed that her nametag was two gingerbread men long. The children dipped various size cookie cutters into paint to make their family members. 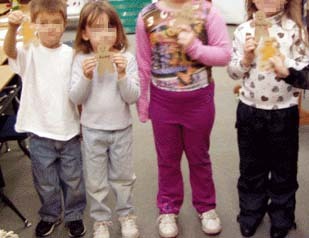 When dry, they labeled them and wrote “I love my family” under the gingerbread family. I made a map of our classroom for each student, mainly using shapes of objects in the room and a few places, such as desks, labeled. Before the students came into the room, I hid foam gingerbread men with each student’s name written on it. As I hid each man, I put an X on his/her map indicating the location of the gingerbread man with his/her name on it. The students used their map to find their own man. Most did this independently, but a few required some help. 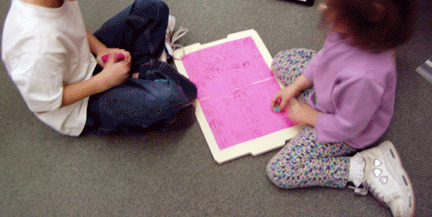 They loved this activity. We’re searching for our Gingerbread Men. 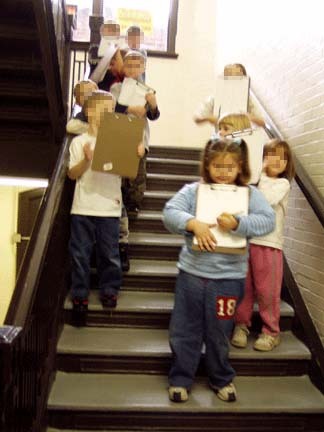 After discussing the map of our classroom, we talked about the features of our school–halls outside the doors, classrooms and offices, steps at the end of the halls, and the large spaces such as the gym and library. 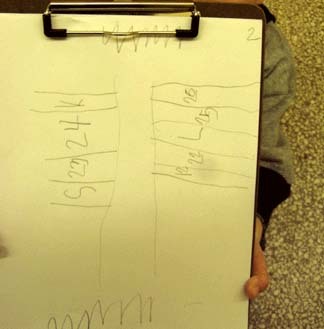 We took paper, pencils and clipboards and drew a map of each floor of our building. This was one of the better ones. The hall is in the center, the classrooms are numbered, and there are steps at each end of the hall. Next, I made a map with arrows for the children to follow to find the gingerbread man. 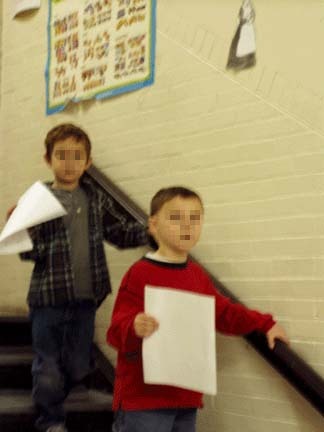 I’d posted copies of the characters on the walls and the students followed the map to locate these characters. 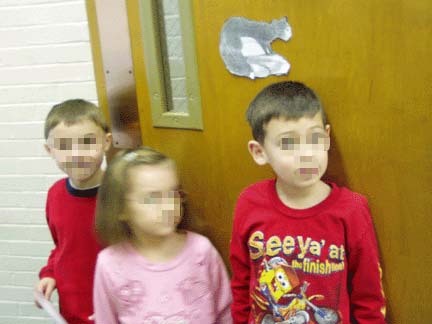 Finally, the Gingerbread man was found outside this classroom. Surprise! He left us a bag of gingerbread cookies. In most of the books the gingerbread man hops on to the fox’s back to cross the river. When he gets his feet wet, the gingerbread tells the fox that he’s “melting”. This student put a gingerbread cookie into a cup of water to see if it would really melt. The wet part of the cookie dissolved. 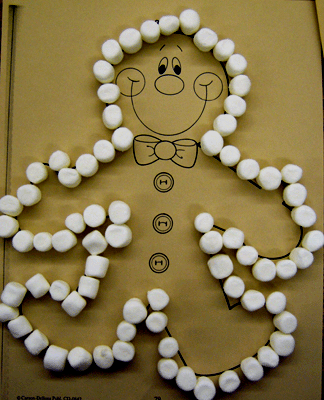 Decorate a precut gingerbread boy. 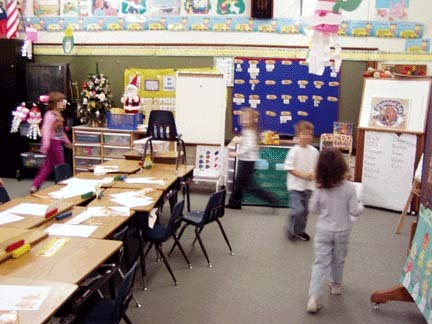 This unit contains books, songs, poems, language/group activities, math activities, learning centers, art activities, snacks, and internet resources. 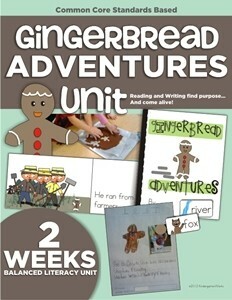 This is exactly what i need, am doing a week on the gingerbread man and was struggling for ideas but now i’m not. Thanks it looks like you guys had lots of fun and learnt lots! i will link to your post in my weekly round up post from Room 28.